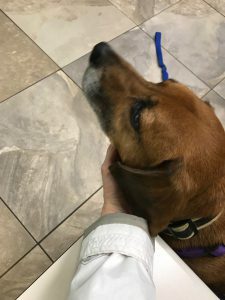 Life has turned into a country song of late: my hubby got sick; Sebastian got diagnosed with yet another ear infection; my 10-year-old dog, Troubadour, got diagnosed with early kidney failure; and then we were in a car accident. The liftgate took the brunt of the impact. The dinosaur sticker survived. But it could have been worse. That’s what we keep telling ourselves. Rich and I have both had some neck and back twinges since, starting right there at the accident site for me. I’m still dealing with some anxiety driving the rental van while my van is being repaired. The back roads and I have become closer than ever since they are not as heavily traveled as Kingston Pike, Middlebrook Pike, or the interstate. Fewer cars means less chance of getting hit again, right? (Fingers and toes crossed.) 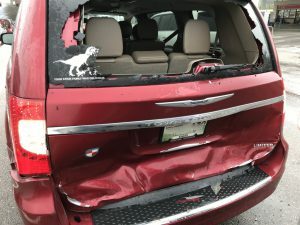 Being in an accident, although minor (thank God), was a literal manifestation of the only recurring nightmare I have, one that started when we were living in Chesapeake. And it was so much worse when it actually happened because both our kids were in the van. But we’re OK. We’re OK. Most importantly, my babies are OK. The van will be fixed soon (I hope), and we are now driving a rental van that doesn’t stink – literally. The Nissan Quest we got at first had not been properly cleaned, had only half a tank of gas, and reeked of cigarette smoke. Cigarette smoke covered up with cheap air freshener. It smelled like what I imagine a vehicle smells like after a cologne-saturated, chain-smoking Johnny Depp is left in a car with all the windows rolled up on a hot day. Yes, that bad. Coraline would start complaining as soon as the doors opened. Also, the Quest had a meh design. It did accelerate like a race car, though, and had XM satellite radio, but those were the only pros on the list. FYI: Don’t rent from the Hertz at Windsor Square in Knoxville; we went with Hertz as Rich has President’s Circle status. Hertz corporate WILL be getting our feedback on that particular location and the vehicle, and it will not be good. At all. Thankfully, the airport Hertz location has its act together. I am now happily driving a CLEAN, fresh-scented Kia Sedona. It doesn’t have the same race-car pickup as the Quest, but it accelerates nicely and has a design we all like much better. Overall, I think it’s a much better minivan than the Quest. It does not have XM satellite radio, but I’m surviving with CDs. First-world problems and all. The tl; dr for this whole paragraph: Hertz Windsor Square, BAD. Hertz McGhee-Tyson Airport, GOOD. Nissan Quest: MEH. Kia Sedona: GOOD. That’s the car stuff. The sick stuff is becoming par for the course, although it’s frustrating, especially with regard to Sebastian’s umpteenth ear infection. As for Troubadour, I’m still processing that. Our vet, who we love and has taken care of many of our four-legged babies over the years, was quick to say that this doesn’t mean Troubadour won’t live for a few more years. Which I pray he does. He’s my second-oldest son, after all. We’re doing our best to keep him comfortable and ensure he’s hydrated. He’s still a heavy drinker, which is good. After five vet visits — including one to the animal ER and two days of IV treatments — in one week, he’s starting to show flashes of his normal, healthy personality again. Last night he even mugged Sebastian, stealing his cracker. I never thought I’d be happy about that, but there you have it. I firmly believe my thieving dog has a lot more living left to do.